The Ruckelshaus Institute conducts research and outreach on many of the natural resource challenges most important to Wyoming and the West. Our team of expert analysts and research scientists works closely with experts from throughout the University of Wyoming, across the state and beyond to produce high-quality reports, findings and other documentation. The Ruckelshaus Institute’s Energy Mitigation Research and Outreach Initiative is an effort to gather, synthesize, and deliver information on mitigation practices intended to ameliorate landscape-scale energy development impacts to wildlife. 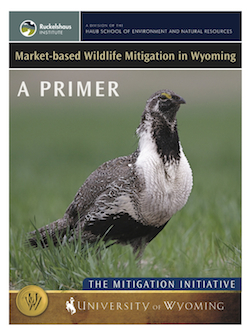 The initiative's latest publication, “Market-based Wildlife Mitigation in Wyoming: A Primer” contextualizes ecosystem services markets. The publication explains mitigation banking, conservation banking, and habitat exchanges and explains how these markets might work in Wyoming. Visit the Energy Mitigation Initiative. The Wyoming Open Spaces Initiative is a collaborative project to make relevant data and information available to planners, policy makers, leaders, and the public to support effective maintenance of Wyoming's open spaces and working landscapes. 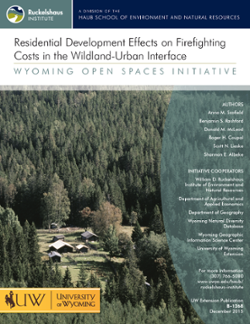 The initiative's latest publication, "Local Government Land-Use Planning in Wyoming" provides information to help empower citizens to become part of the land-use planning process in their local communities.. Visit the Wyoming Open Spaces Initiative. The Ruckelshaus Institute also publishes conference proceedings, reports, and white papers. Browse more Ruckelshaus Institute publications. This publication contextualizes payment for ecosystem service markets and explains mitigation banking, conservation banking, and habitat exchanges and how these markets might work in Wyoming. This publication suggests planners and local governments can play an important role in reducing wildfire suppression costs through strategic land use planning. 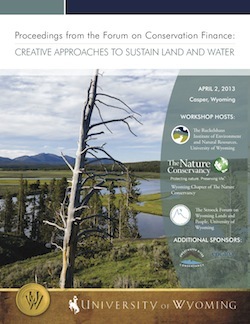 This forum took place in Casper, Wyoming, in April 2013 and built an informational foundation about a range of conservation finance tools, both established and emerging. Speakers shared real-world applications, success stories, and challenges using various conservation finance models in government and the private sector to inspire further practice of conservation finance in Wyoming. 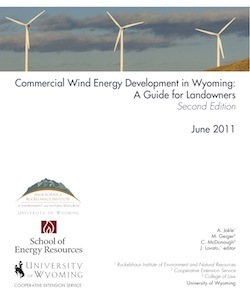 This guide outlines the process of wind energy development for landowners and highlights key issues they may face. It also provide updates on the growing practice of landowner wind energy associations and the changing legislative landscape in the state.